Name: James Wayne Herrick, Jr. Source: Compiled by Homecoming II Project from one or more of the following: raw data from U.S. Government agency sources, correspondence with POW/MIA families, published sources, interviews. Updated by the P.O.W. NETWORK. SYNOPSIS: Jim Herrick was born on a farm in Guthrie Co. Iowa, the oldest son of the Herricks. He had paralytic polio at the age of 7, but by the summer of his 8th year was completely recovered with no trace of paralysis. He had a normal, active youth. In school at Iowa State College, Jim was in the Air Force ROTC, and went to flight school following college. He volunteered for overseas duty and was sent to Southeast Asia in May 1969. With its fantastic capability to carry a wide range of ordnance (8,000 pounds of external armament), great flight range (out to 3,000 miles), and the ability to absorb punishment, the single-seat Douglas A1 Skyraider became one of the premier performers in the close air support and attack mission role (nickname: Spad) and RESCAP mission role (nickname: Sandy). The Skyraider served the Air Force, Navy and Marines faithfully throughout the war in Southeast Asia. On 27 October 1969, then 1st Lt. James W. Herrick, Jr., was the pilot of the #2 aircraft (aircraft #52-137539) in a flight of two, call sign "Firefly 33." 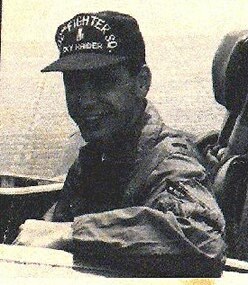 The pilot of the lead aircraft was 1st Lt. James G. George, call sign "Firefly 32." The flight departed Nakhon Phanom Airfield at 1317 hours to conduct an armed reconnaissance mission in Recce Route 7, Barrel Roll, to locate and interdict enemy activity along this section of the infamous Ho Chi Minh Trail that ran through the Ban Ban Valley, Xiangkhouang Province, Laos. Weather conditions in the target area included an overcast cloud cover with flat tops at approximately 7,000 feet and low scattered clouds. These conditions hindered the pilots’ ability to visually explore Route 7 as it ran through the valley, then through the heavily wooded and mountainous region to the east. The Skyraiders were able to set up their mission in the clear above the clouds over the center of the valley. A few of the mountain peaks protruded slightly through the cloud deck. Both 1st Lt. George and 1st Lt. Herrick were experienced flight leader pilots whose knowledge of this region was extensive. During their pre-flight briefing, Jim Herrick told Jim George that he had been flying this particular road reconnaissance mission for the past few days. He added that "he had been watching one or two bombed out truck hulks that were located right at a 90 to 100 degree bend in Route 7 where the road turns into the "Fish’s Mouth," a landmark so named by the Americans, that then ran into North Vietnam. Further, Jim Herrick voiced his desire to "check out the truck hulks to see if they were moving them, salvaging parts or anything else." Jim George agreed to his request to check them out as they pursued the mission. As the flight approached the target area, 1st Lt. George checked in with "Cricket," the on-site command and control aircraft, for permission to initiate their mission. Once granted, 1st Lt. Herrick held in a high orbit over the valley while 1st Lt. George did a spiraling descent on instruments through the clouds to the jungle-covered valley below. When he broke out of the clouds at an altitude of 1,000 to 2,000 feet above the ground, Jim George found the weather was quite clear with good visibility. He radioed his wingman to make the same spiral descent to join him below the clouds. After forming up, Firefly 32 and 33 turned south to locate the road, which crossed the southern portion of the valley. 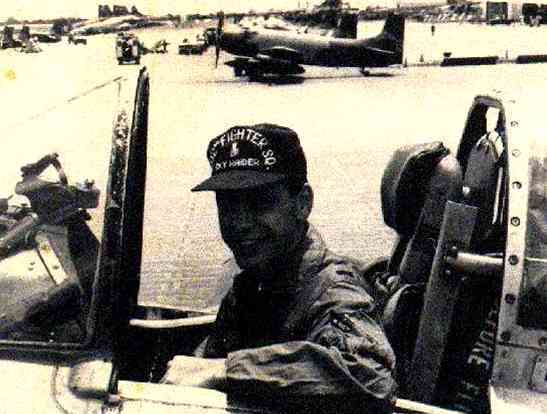 With Jim Herrick flying roughly � mile behind and to the side in a trail/cover formation, they worked their way east toward the Lao/Vietnamese border and a landmark known to the pilots as the "Bird’s Head." As they proceeded east, the weather slowly deteriorated while the terrain rose gently squeezing them slightly between the clouds and the ground. As the road turned back toward the south over the Bird’s Head, the terrain became gradually lower, but at the same time, a few kilometers further south, the cloud ceiling was also lowering with the clouds looking more ragged below the cloud undercast. After making a 360-degree turn to evaluate the current weather conditions with 1st Lt. Herrick visually following him, 1st Lt. George determined the weather conditions were too dangerous for them to continue working under the clouds. Lead radioed his intention to turn north and climb above the clouds and his wingman should follow him. This climbing right turn would take them away from the very high terrain that was to the north and east of the Bird's Head. At 1452 hours, shortly after initiating the climbing turn, 1st Lt. George broke into the open. He looked over his shoulder expecting to see 1st Lt. Herrick break through the clouds behind him. When he did not see Firefly 33, he radioed his wingman requesting his position. Jim Herrick replied that he was in the clear over the Bird’s Head. 1st Lt. George then requested an altitude check, to which 1st Lt. Herrick replied that he was at 4,500 feet, which was approximately 1,000 feet above the ground. Firefly Lead transmitted again for his wingman to join him on top of the clouds adding that he was going to change frequencies to give Cricket an updated weather report. By the time Jim George returned to the operational frequency, he was unable to reestablish radio contact with Jim Herrick. After contacting "Ethan," the radar control aircraft responsible for separating inbound and outbound flights from each other, Firefly Lead circled the area above the clouds. When he found no sign of his wingman at altitude, 1st Lt. George requested Cricket call in search and rescue (SAR) aircraft to conduct a formal search. Jim George then retraced their flight path beginning with another spiraling descent over the Ban Ban Valley and flying the length of Route 7 past the Bird’s Head in the same deteriorating weather he encountered earlier. According to Jim George, "Jim Herrick had expressed a strong interest to check out the damaged truck hulks he had been watching over the past several missions located just a few kilometers further south from where I called off our Road Recce, I felt he may had decided to go on down there to have a look before climbing up. Thus, when I reached that point where we had previously stopped, I decided to continue on despite the poor weather." Jim George went on, "The weather was much lower down by the big, sharp left turn into the Fish’s Mouth that I didn’t think I could make the turn, so I did a wide right 270-degree turn to the west, where the terrain was lower and I could stay visual, then headed back straight east to fly over the road to the east, which had high terrain immediately on both sides of it. I found myself trapped over the roadbed, but was now committed. I was under a solid 100-foot overcast, in between the rocks which formed a narrow ‘valley’ that was only a couple of wingspans wide and 100 feet tall at best – road on the bottom, mountains on both sides and solid overcast above." With the exception of one small jog, the road ran very straight into North Vietnam. After passing that jog, Jim George did an instrument climb to a safe altitude. After studying his area terrain map to orient himself to Route 7 on the North Vietnamese side of the border, he once again descended below the clouds. Knowing he might cross the border into North Vietnam, Jim George turned off his transponder before proceeding east along Route 7. Flying below the clouds at an altitude of only 50 to 100 feet, he searched the narrow valley for his wingman. Finally he turned north in better weather inside North Vietnam, beyond the big ridgeline that had been off to his left as he flew east over the road. Having found no trace of his wingman, Jim George had no choice but to return to base. Over the next few days, in addition to the formal SAR operation, pilots from the 602nd Special Operations Squadron thoroughly searched the Ban Ban Valley and Route 7 for signs of Jim Herrick and his aircraft. The weather remained poor with clouds obscuring the area. During a routine flight on 30 October 1969, wreckage and a burned area at the approximate last known position of 1st Lt. Herrick’s aircraft was found in the high terrain to the northeast of the Bird’s Head. Though unable to identify the wreckage as that of a Skyraider, the observer’s extensive knowledge of the area enabled him to positively state that it had not been there 5 days before when he had previously flown over the area. Further, heavy enemy activity prevented a ground search of the wreckage and the surrounding area. At the time the search was terminated, Jim Herrick was listed Missing in Action. The crashsite was in an area heavily populated with hostile forces approximately 8 miles southeast of Ban Ban Valley, 18 miles west of the Lao/North Vietnamese border, 38 miles east of Muang Phonsavan Airfield and 41 miles east-northeast of the Plaine des Jarres. It was also 157 miles north-northwest of Nakhon Phanom Airfield. Jim George wrote to Jim Herrick’s family about his friend and wingman: "Let there be no doubt in your mind that Jim was a good young pilot. This was true in order to be rated high enough in his pilot training class to win an assignment to the A-1, and further, to be checked out as a Fight Lead in combat. He was, like all of us, dedicated to what he was doing and determined to do it to the utmost of his ability." 1st Lt. Herrick is among nearly 600 Americans who disappeared in Laos. Many of these men were known to be alive on the ground. The Lao admitted holding "tens of tens" of American Prisoners of War, but these men were never negotiated for either by direct negotiation between our countries or the Paris Peace Accords since Laos was not a party to that agreement. If Jim Herrick died in the loss of his Skyraider, he has the right to have his remains returned to his family, friends and country. However, if he was able to eject from his aircraft his fate, like that of other Americans who remain unaccounted for, could be quite different. Either way there is no doubt the Vietnamese or Lao could return him or his remains any time they had the desire to do so. Since the end of the Vietnam War, over 21,000 reports of American Prisoners, missing and otherwise unaccounted for have been received by our government. Many of these reports document LIVE American Prisoners of War remaining captive throughout Southeast Asia TODAY. Pilots in Vietnam and Laos were called upon to fly in many dangerous circumstances, and were prepared to be wounded, killed or captured. It probably never occurred to them that they could be abandoned by the country they so proudly served. James W. Herrick, Jr. graduated from Iowa State College in November 1967. I have a POW/MIA bracelet wore with Lt. James Herrick Jr. 10-27-69 on it. Over the years it has passed from one box to another. for some reason I am thinking my mom gave it to me via our mechanic in Long beach, CA. Some how Lt. Herrick was related to this man. I wore it until it broke, putting it away. I had always thought that perhaps I would return it to him. Being only about 7/8 at time death wasn't a part of my thought process. Just knowing he would return home to his family was. If Lt. Herrick's family would like this I will be willing to send it to them. Please have them contact me. Thank you Lt. Jame Herrick for your service to your country.